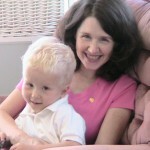 Today my ClubMom topics, homeschooling and special-needs kids, come together. I’m taking Wonderboy to our local public school—yes! I said public school!—for a meeting and evaluation with the special education office, a speech therapist, and the district audiologist. Even though we plan to home-educate this child like all our others, we can and will avail ourselves of the special services made available to all children according to federal law. From birth to age three, qualifying children can receive services such as speech therapy, physical therapy, and occupational therapy through Early Intervention programs. Wonderboy received all of the above, in our home, beginning at about four months of age. (For PT & OT, that is. When his hearing loss was diagnosed months later, we added speech & hearing therapies.) The first step in the Early Intervention process is an evaluation that leads to the writing of a big ole document called an IFSP—an Individualized Family Service Plan. At age three, children age out of Early Intervention and from that point on, the special services they qualify for come through the local public school district. The IFSP gives way to a new document, the IEP, or Individualized Education Plan. The IEP spells out what services the child requires and how the district is to go about answering the need. The whole IEP process can be tricky to navigate, or so I’ve picked up from several friends (public-schoolers, not homeschoolers) whose older children were diagnosed with learning disabilities or autism spectrum disorders. Those parents had to be sharp-witted advocates for their children to make sure that all their classroom needs were being met. For us, it’s a bit simpler. Wonderboy "graduated" from PT before we left Virginia (amazing, amazing! miracle boy! ), but he will almost certainly continue to need some speech therapy during the next several years. His verbal language skills are growing by leaps and bounds—really, it’s so exciting; he’s using long sentences now, like when I hollered "Ladies! Dinner’s ready in five minutes!" and he BOOKED down the hall shouting, "GIRLS! Time to eat! Dinner!" Excellent progress. But of course since he still lacks most consonants, it sounded more like "GUH! I oo ee! Ginnah!" I want to make sure he has every advantage. I know his verbal skills will continue to improve naturally as he gets older. But he may need extra help to master certain sounds. And so after we got settled in here, I called the district spec ed office to see what kind of speech program they have. After a lot of faxing (his IFSP and audiology reports) and phone calls—just the normal process!—we set up an evaluation with the aforementioned folks. Today we’ll be meeting to determine what goes into his IEP. I’m going to blog the process, because I haven’t found too much else out there about homeschoolers and IEPs. I might hold off on attending the speech therapy sessions until next fall, depending on how today’s eval goes. At Wonderboy’s age (he’ll be three this week! ), speech therapy takes place in small parent-child sessions at the school up the road. That sounds great—but I can already see that timing will be tricky. I don’t know that I want to chop up a morning once a week with a jaunt to speech therapy. That’ll monkey with my older kids’ schedule. But we can figure out the logistics later. Right now, step one: the speech evaluation. Do You Write Down Your Children’s Narrations? OOO! OOO! (That’s me sitting in the back raising my hand frantically!) Speech- my favorite topic! I am a speech therapist. I love my job. I love it when it all ‘works’. When families and therapists find a quality mix of therapy and home ‘speech’ work that gives amazing results. It’s a fasinating field to work in. LOVE IT. I’m a huge fan of sharing information about the process (it is a DAUNTING process and I always get so extremely sad when parents end up feeling frustrated or overwhelmed or in any way negative about an experience they’ve had with special education- because often times those negative feelings can be tracked back to the PAPERWORK PROCESS vs. the SERVICE). I sometimes find that the process is so convoluted that it makes the service seem almost not worth it- when in reality the service that spec ed can provide can be crucial and so rewarding. and be willing to be a creative problem solver on the team (working out the logistics of ‘how’ needs some patience, compromise and willingness to face a challenge. Please, please, please communicate to the IEP Team your roadblocks to scheduling speech therapy sessions -you may be pleasantly surprised by some creative flexibility in scheduling. You’ve HEARD that speech therapy is offered in a certain school from ‘x’ to ‘y’ time… but I can guarantee you that there are probably more options out there. 2- Preschool age speech therapy success is HIGHLY dependent on parental commitment / attention to the goals. Can you also identify some time within each day that is SPEECH TIME? My most successful preschool students are one who have SOME speech therapy time and A LOT of HOME speech therapy follow through. (Case in point- I acquired a kindergartener who had been in speech therapy since he was 3; there was no ‘home’ program – let’s just leave it at that. I won’t rant about it. Kid was making nearly no progress. I meet with mom, we agreed on a list of 10 words he has to master by xmas in order to get that little extra gift. Mom is going to even wrap that extra $5 gift in paper decorated with his sounds-‘K’ and ‘G’ all over it- to drive the point home. Already- only ONE WEEK LATER- the classroom teacher walked up to me and said WOW! He’s IMPROVED BEYOND BELIEF! 3-Districts often times have more than one therapist. So, if you cannot find common planning ground with the therapist at the meeting- ask if there is another therapist who may have space/time/flexibility at a time other than time ‘x’. 4-Can I BEG you not to wait until fall? This age frame for language growth is so precious – it’s like gardening- planting time is planting time. You’ll still get a pumpkin if you plant later, but not the biggest pumpkin. Your kiddo is in the middle of ‘planting time’. WonderBoy needs consonants planted. Seedlings need to already be growing. On that note- this is an example of what I mean ‘be creative’…. How about YOU collaborate with the speech therapist via PHONE once or twice a week- or internet. Email. Video exchange. Heck, you could YouTube your kid and only give the URL to the therapist. The therapist develops a home program for you, you implement it at home and report back to the therapist. You could even go so far as to videotape WonderBoy and submit those tapes to the therapist 1x per month to assess his progress. Can’t get him physically to the appt? Great. You and the therapist agree on a phone conference time. You call the therapist. She gives you a ‘task’ to try. You videotape yourself doing that task with WonderBoy. Drop tape off at school (or post it online). Speech therapist supports you and WonderBoy on how to go forward. Heck, the way I’m presenting this *I* could be Wonderboy’s speech therapist! On that note- remember, this is a SERVICE- so if you are not pleased with the service you have the right to ‘shop’ elsewhere. A different therapist in the same district, a different therapist through a medical settings, a therapist somewhere else in some other city who you ‘click’ with. Speech therapy for your child is only going to work as well as the team works. And if it all seems to fall apart… we’ll talk more! We’re a step behind you on the IEP trail, as we’re in process of transitioning from EI to seeing what is available for my almost 3 yo in the schools. We had a transition meeting yesterday, and his evaluation is next month (he’s not 3 until late February, and receiving ST services already through EI). one step at a time – we have homeschooled and are currently using our public school for our older children, and in the back of my mind, I lean toward homeschooling again with my littlest. But not sure how it will work out. Glad I know already that it’s OUR choice what to do. Can the district audiologist do ear molds or supply what you need to get them done soon? And I’m curious about how’s that doctor hunt coming along? Peggy, thanks so much for all your ideas and suggestions. I want this site to be a resource for parents, so it’s really really helpful to have input like this! As you guessed, she is eager to accomodate our scheduling needs any way she can–including giving me space for the older kids to set up camp, if I need to bring them. Or I might be able to do an early morning session before Scott leaves for work. Tracy, YES!! There IS a district audiologist and she CAN do his ear molds! Can you hear me cheering? I’ll update on that too in the next post. Yes, the transition from EI to “preschool” can be very difficult, especially if the child does not have “global” deficits. As a professional (OT) I experienced the difficulties in MA. I was a preschool consultant and often had trouble getting, say, just speech for kids. The school system only wanted to pay if the child was in need of multiple services, and was going to attend a “developmental preschool”. Fortunately, personally, the Maine system worked out well for our family. My second son, Michael, had pretty significant speech articulation problems (but no other speech deficits). He qualified for speech therapy in Maine, through Child Development Services (CDS). This agency covers birth-5. He was discharged after a year. He was on an IFSP(at 3 years old). He still has some minor articulation problems, but I hope they will improve as he gets older. I used the public school services (in VA) for my daughter while homeschooling my older children. We just brought our schoolwork with us and sat in the office. We took the first appointment of the day- just before the bell rang and we were out of there before the school got too crazy and still had the whole day for schoolwork at home. Just had to post a quick follow-up: I finally took a few minutes to read your archives – specifically about WonderBoy’s history. You are a speech therapists DREAM family. Seriously. The sharing of parental turn taking to audiologist appts, the glow in the dark molds and the fun you create with them, the FM system game made me laugh OUT LOUD for nearly 10 minutes. The interest – and more importantly- the attitude of humor mixed with sincerity you have established for working with issues of hearing loss is to be applauded. a big ole hands shaking in the air sign language applause. And a hand extended from chin outward … ‘thank you’ from WonderBoy. I’m so glad you’re blogging this whole process, because not only do you offer encouragement, sunshine and help to those with special needs, but you show that it can all be done within the parameters of homeschooling! I think that even dedicated homeschoolers are sometimes daunted by special needs, but — like everything else — it’s a matter of educating oneself and moving on from there.